The project bike has been plagued with a few nagging obstacles. Work overload has been by far the biggest obstacle, but bike deficiencies coupled with my own sense of how things must be are also limiting progress. After the initial inventory, step two was a reasonably thorough cleaning. The bike was partially disassembled, washed, and de-greased. The parts intended for re-use were re-lubed and re-installed. I didn’t take the time to polish the components, but the remaining luster on some of them was still quite satisfying. Step Three was sorting out the wheels. The original plan was to use the existing wheels. 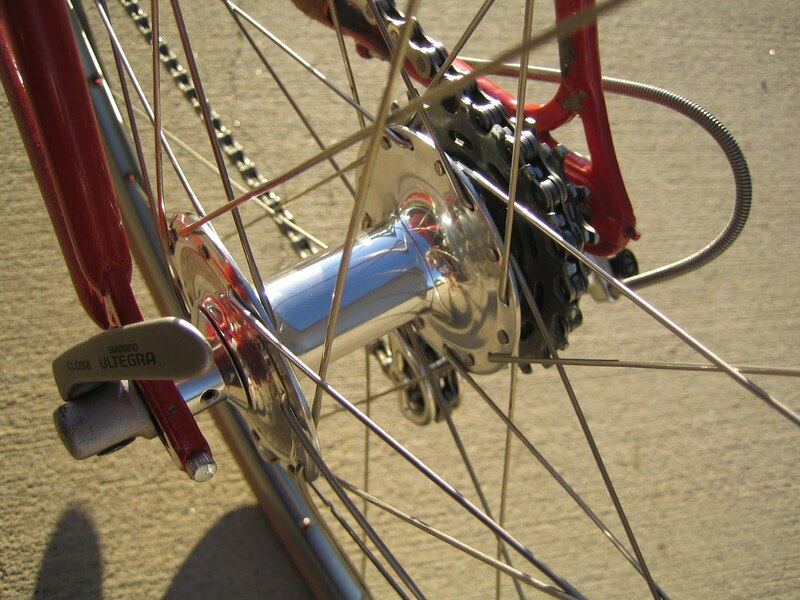 However, the Campy Moskva 80 rims, due to their apparent slightly oversized diameter, proved to be a major hassle for tire removal/installation. Besides, I have a nice pair of Mavic Open Pro wheels that are lighter and more pleasing to the (my) eye. The Mavic front wheel was fine as is. The Mavic rear wheel included a Shimano Ultegra freehub, which is not compatible with my frame spacing or the Suntour 6-speed freewheel that came with the bike. So I asked Bernie at Trinity Bicycles to find me a reasonably priced hub and build me a new rear wheel using my rim. He recommended a Suzue hub that looks pretty good, and the wheels are complete. Another satisfying step. The wheel photo above illustrates what an irreverent mixture of parts this bike will have. Mavic rim, Suzue hub, Suntour freewheel, Campy rear derailleur, and Shimano skewer. I’m afraid this will be the ugly duckling of frankenbikes when finished. Yet, I remain optimistic that this creature will be able to inspire a little pedaling intensity out of a long hibernation. I think it's looking great. Back in 1977, at the age of 14, I put together my first racing bike, a Nishiki Pro. I paid for it myself by shoveling driveways all winter and cutting lawns during the summer. As I earned enough money for another component I'd head down to the LBS in Pittsburgh were I lived and would buy whatever I could afford. At the time I wanted Campy Super Record. What I could afford was a mismatched mix of Dura-Ace, Suntour, some Campy and Dia-Compe. The beauty of it was all those components would work together. Something you couldn't do nowadays. I raced that bike every Thursday night at the local club races in Pittsburgh. I was spinning the USCF Intermediate Boys restricted gearing of 89 gear inches. But I was racing head to head with the likes of Davis Phinney, Matt Eaton and the Chew brothers. In Davis' latest book, The Happiness of Pursuit, he says those were some of the most competitive races he had ridden at that time. Of course Davis would later become the winiest American Pro ever (many more pro wins than LA), Matt Eaton would be US Mens National Champion in 1984 and winner of Britain's biggest stage race The Milk Race, and in the 90's Danny Chew would later be a two time winner of RAAM. And little ole me was racing right along with those guys, hanging on for dear life, and having the time of my life on that pieced together frankenbike. My proudest result I would have would be a 13th place at the USCF Road National Championships in the Intermediate Boys Class in 1978 in Milwaukee. All thanks to that bike and the high quality of racing I was exposed to. The moral of my story? You can do some amazing things on a frankenbike. "I didn't take the time to polish the components, but the remaining luster on some of them was still quite satisfying. "In the case of unrestored older cars and many other collectibles, this is called "patina" and it is very desirable not to destroy it via unnecessary "restoration." Bravo for not polishing just to polish! Thanks, Doug for the great story. I didn't realize you were such an elite racer. The only hope I have for my frankenbike is that it works well enough to encourage me to push the pace more, and get some of my fitness back. …and I still have that Nishiki Pro, although I haven't ridden it in years. I still have thoughts of bringing it back to life and digging up some Campy Super Record parts for it. The Campy parts like I always wanted back in the day. If it weren't for frankenbikes, my garage would be nearly empty! Well, at least empty of two-wheeled objects. Also, IMHO your Trek is anything but ugly; even with the mixture of components you've listed. 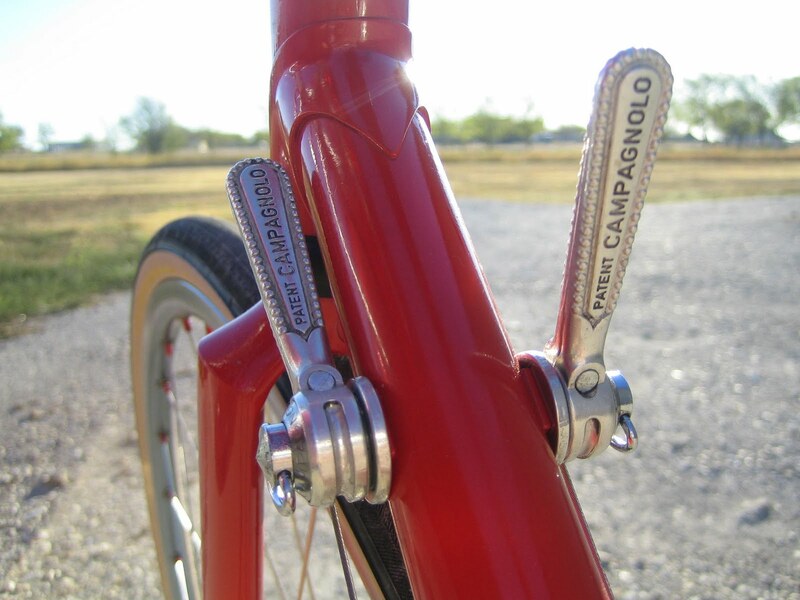 Those Campy shifters have a certain timeless beauty about them and I really like that shiny red paint! I'm looking forward to seeing (on line) the finished product. Looks like my kind of build! Looking very nice. I hope that I can get my project to look half as good. Wow. Too bad work has to interfere with our hobbies. Why must we be productive members of society?I like the Campy parts on your bike. That stuff shines up nicely. Nothing wrong with mixing and matching. Think of it as, umm, choosing the best parts regardless of maker? I don't know. I love mutts, at any rate, both in dog terms and bike terms.